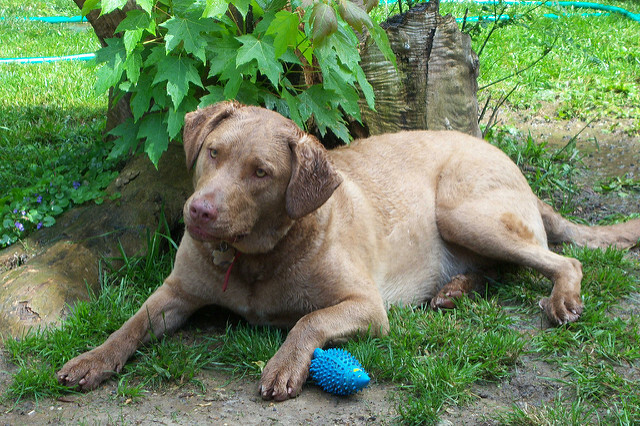 Often called the Chessie, CBR, and the Chesapeake, the Chesapeake Bay Retriever is a breed that is well known for loving water and the ability to navigate easily through rough and freezing waters. The breed is part of the Sporting Group and the AKC first approved the breed in 1993. If you’re considering this breed for your family, here’s a closer look at the breed’s history, appearance, temperament, and more. Chesapeake Bay Retrievers were first created in the 1800s within the United States from two Newfoundlands that had been rescued from a Maryland shipwreck. These dogs has excellent retrieving skills and loved the water, so they were crossed with other types of retrieving breeds, such as the English Otter Hound and the Curly Coated Retriever, to create what we know as the Chesapeake Bay Retriever today. These dogs were specifically bred for retrieving and hunting and they were named for the Chesapeake Bay, where they often swam through choppy, ice cold waters to help retrieve ducks. 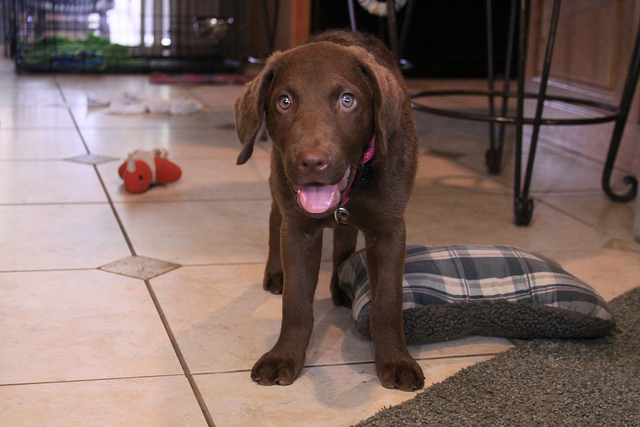 A look at the Chesapeake Bay Retriever shows that the breed comes with the classic appearance of other retrievers – hanging ears, short hair, and a muscular body. These dogs have rounded heads and a medium muzzle and stop. Chesapeake Bay Retrievers have a medium length body, strong chests, and their rear is even or a bit higher than the withers. 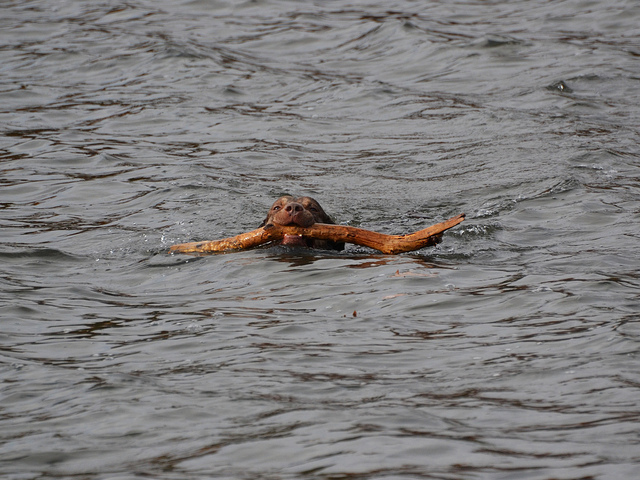 The breed also features strong hindquarters, lean, long legs, and webbed toes, which make them great swimmers. Chesapeake Bay Retrievers have a water resistant, short coat. The top coat is very short, oily, and thick, and they have a dense, fine undercoat. This unique coat offers great insulation, making it possible for these dogs to hunt in any type of weather. 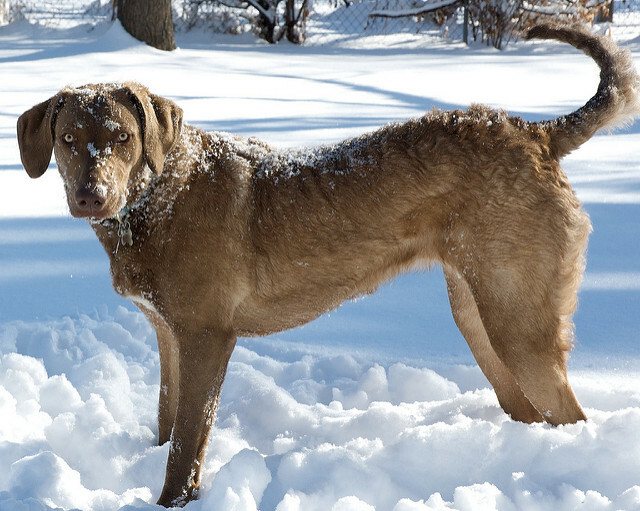 Not only does the Chesapeake Bay Retriever have a coat designed to resist the water and weather, their coloring helps them stay camouflaged as well. Their coat comes in various shades of deadgrass, sedge, and brown. In some cases, these dogs may have a white spot on their feet, toes, chest, or belly. Males usually stand between 23 and 26 inches tall, while females usually stand 21 to 24 inches tall. The male Chesapeake Bay Retrievers generally weigh from 65 to 80 pounds, while females weigh from 55 to 70 pounds. 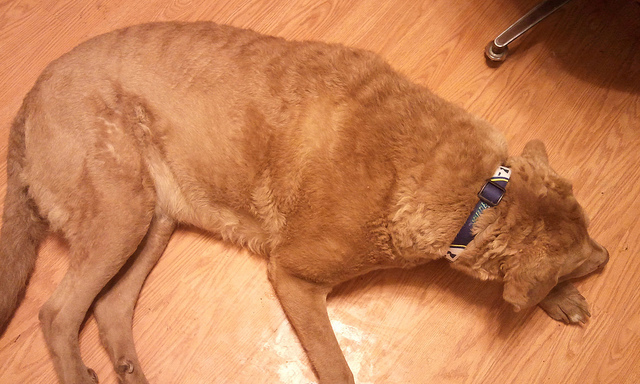 Of all retrievers, Chesapeake Bay Retrievers happen to have the strongest personalities. These dogs aren’t as easygoing as the other retrievers, they are harder to train, and they have an independent streak. However, while they might have a strong personality, they are durable, strong hunting dogs and can handle being out all day in cold waters. They make great dogs for outdoor individuals and they love going camping, on hikes, bike trips, or jogs. These dogs need plenty of exercise and they love being outdoors. They don’t do well in apartments and they continue to be rambunctious and rowdy, even when they are adults. If they don’t get enough exercise, they are often destructive. To train the Chesapeake Bay Retriever, consistency and a firm hand is important. They need a strong leader, although they shouldn’t be disciplined or treated harshly. Patience and positive reinforcement work best for these dogs. Since the Chesapeake Bay Retriever sheds heavily throughout the year, it’s important to make sure the coat is brushed weekly. This helps to keep the oils of the skin distributed while removing loose, dead hair. 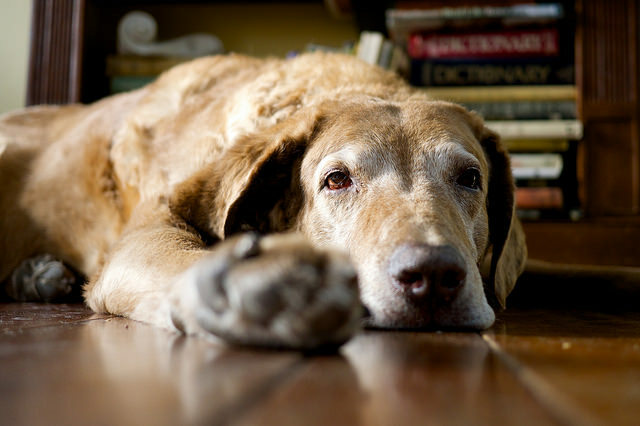 Brushing more often can prevent shedding throughout a home for dogs that are indoors. It’s important to only bathe Chesapeake Bay Retrievers as needed to avoid breaking down the water resistant oils that are naturally on the skin. It’s also important to check the ears of the Chesapeake Bay Retriever each week for infection, particularly if the dog is in the water often. To prevent ear infections, use a cleanser that has been approved by your vet. Brushing the dog’s teeth weekly is essential for keeping away bad breath and tooth decay. If nails are not naturally worn down, nail clipping may be needed from time to time. Chesapeake Bay Retrievers were bred to be working dogs. They were specifically bred to retrieve water birds, such as ducks. While many of these dogs are simply valued family pets today, some owners still use these dogs for duck hunting or for hunting and retrieving other waterfowl.